I love all the Faux Deer Mounts going around, so I decided to give you my take on them. 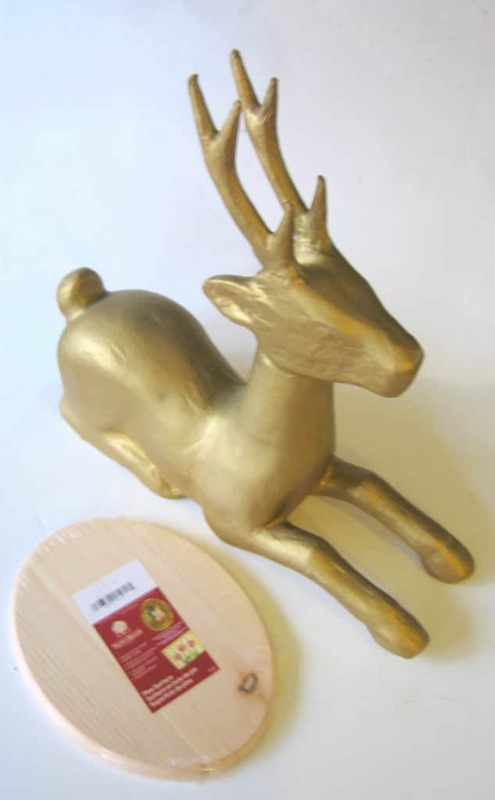 I started with a faux gold Christmas deer from craft stores I’ve had for a while and did some taxidermy on him. Cut the head and shoulders off of your deer at and angle with a sharp bread knife. 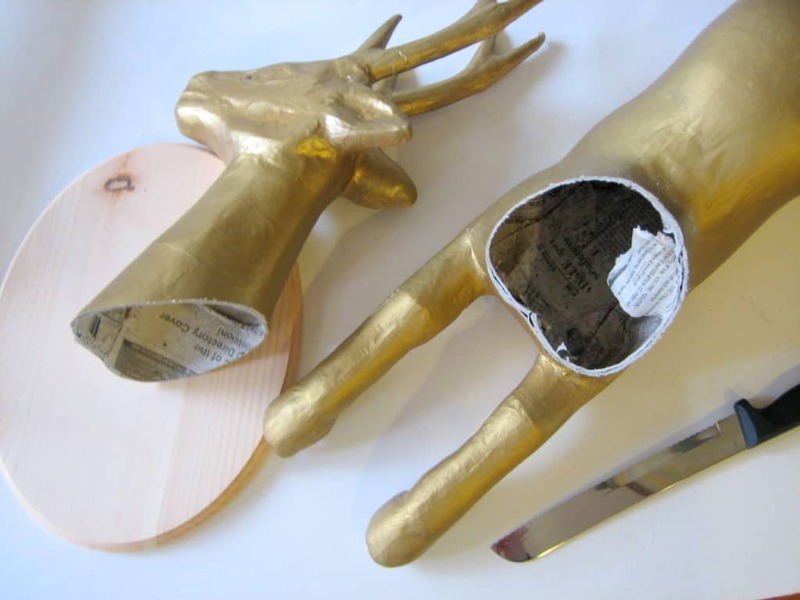 Cut around the base of the antlers to loosen the paper mache, then pull the antlers off. I had planned on making the antlers bigger using news paper and Mod Podge but it just wouldn’t hold and smooth out like I wanted. Hence the backyard excursion. 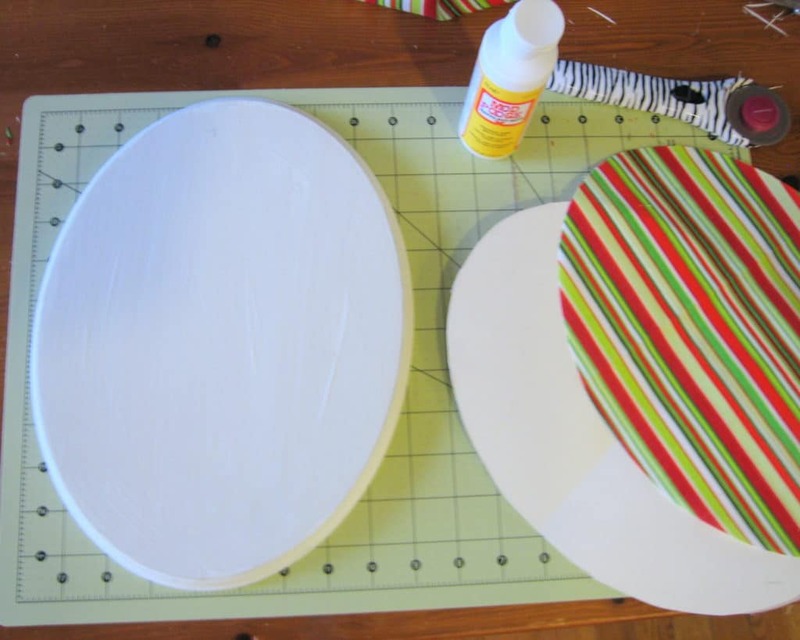 Take your poster board and rotary cutter and make a guide for your fabric for the plaque. Cut out your fabric. Tip: beware of striped fabric and decoupage: It is very tough to get the stripes the lay straight, the fabric stretches. Another choice of fabric pattern would be better or maybe use cardstock instead. 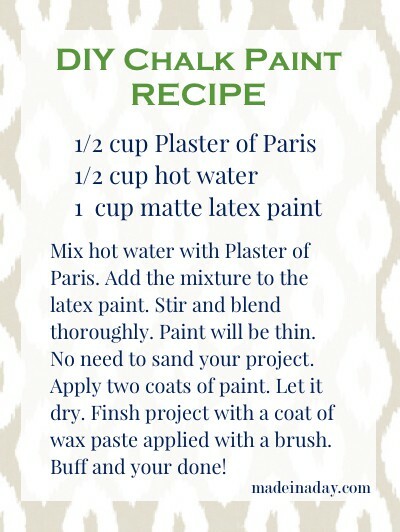 Paint your plaque and deer head with White Chalk Paint, see my recipe below. Let them dry. Decoupage the fabric with Mod Podge to the plaque. Let it dry. Turn the plaque over and add your picture hanging hardware. I placed the deer head on a large cup to handle it better. Then I headed out to the backyard and looked around for two large branches that would flow together. 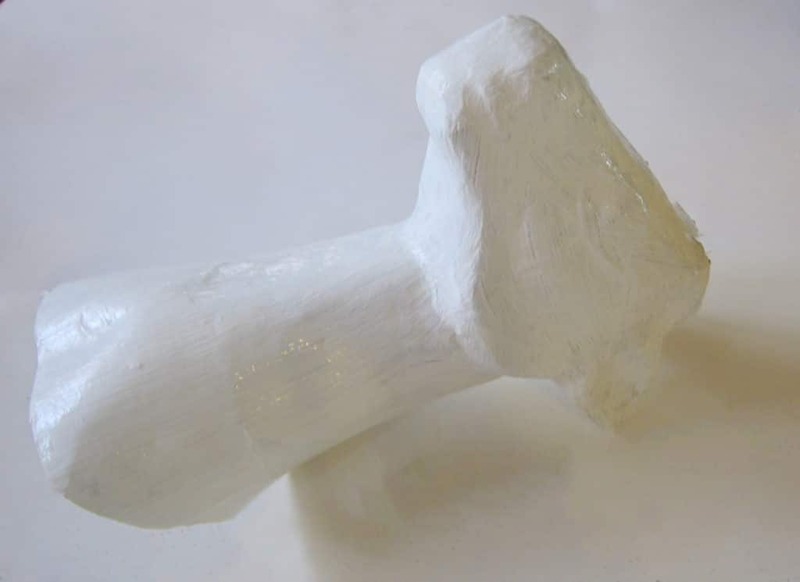 Stick a branch into an antler hole and arrange like you want it, then fill the hole with hot glue to hold it. They are heavy so hold them for a few minutes until they dry. This part was amazing easy, thank goodness. Then hot glue your deer head to the plaque. I added silver retro looking branches I hot glued into a wreath around his neck. And that’s it! He is so funky and will go great with my Christmas decor. I may change the fabric after Christmas so I can leave him up all year. Not bad for an almost project fail. I love this idea, it looks amazing. It would look very nice in my house. Great job. this is AMAZING!!! totally love it! Love, love, love!! Brilliant idea. Pinning! What a fabulous idea! 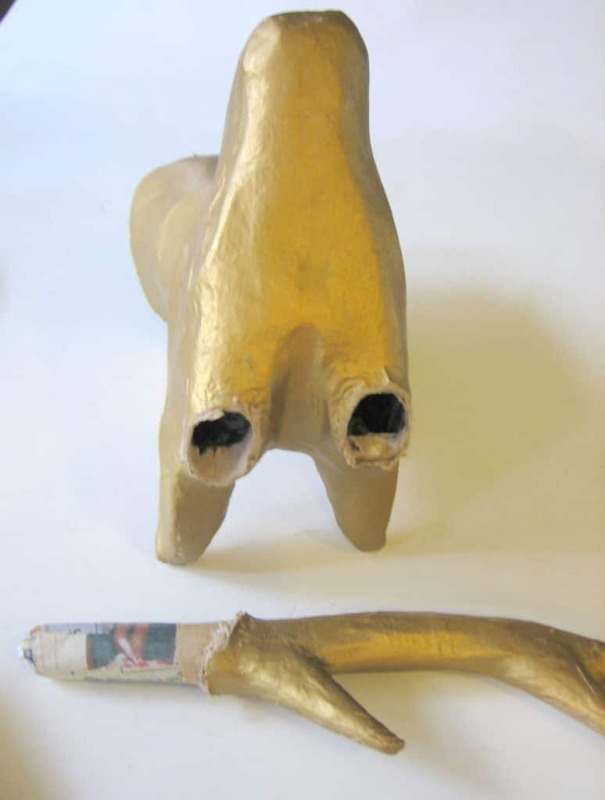 I’m working on my own stag head creation also….hopefully will be done soon. Anyway I’m featuring this tonight..thank you for sharing! 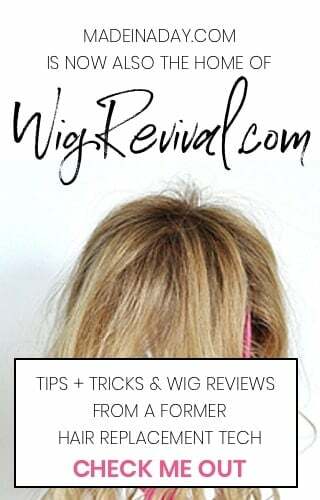 I’m featuring you on my blog tonight thanks for linking up at my What We Wore, Read, and Made Link Party what an adorable creation! Great job! I love this. Wow! How cute and creative! I absolutely love how it turned out. Great job! Thanks for sharing on Sweet Saturday (I was the co-host this week). This is SO cool! 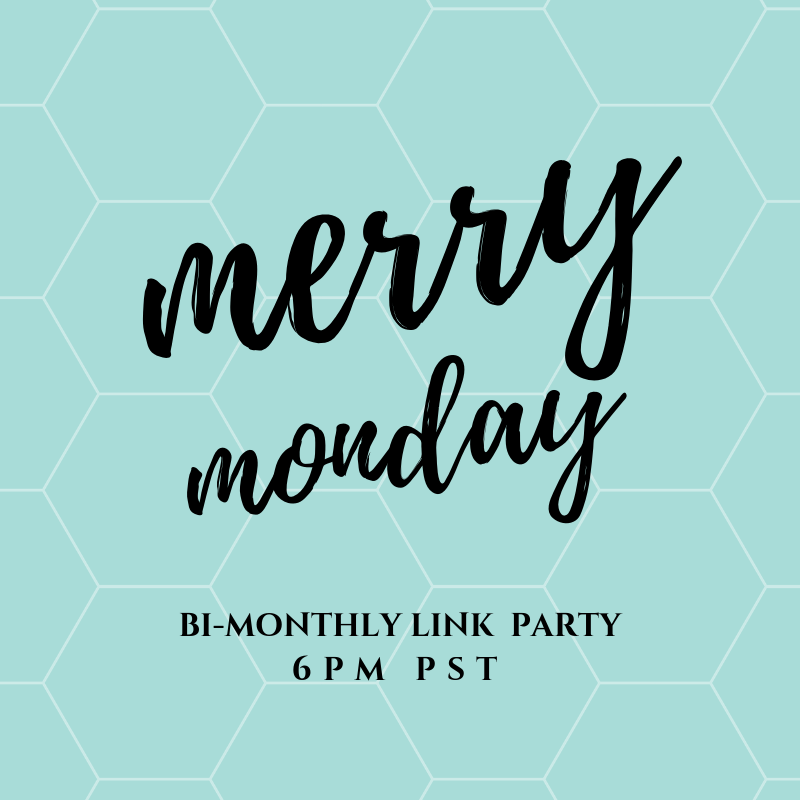 Featuring you today and I’m so glad you linked up to the what’s shakin’ link party!! Fantastic project! It looks lovely. This is awesome! 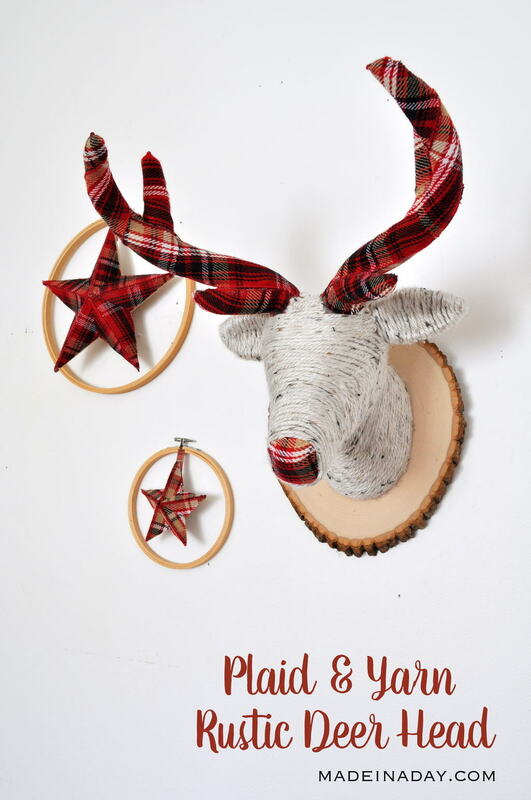 I always see those cheap faux Christmas deer and would have never thought to do this! 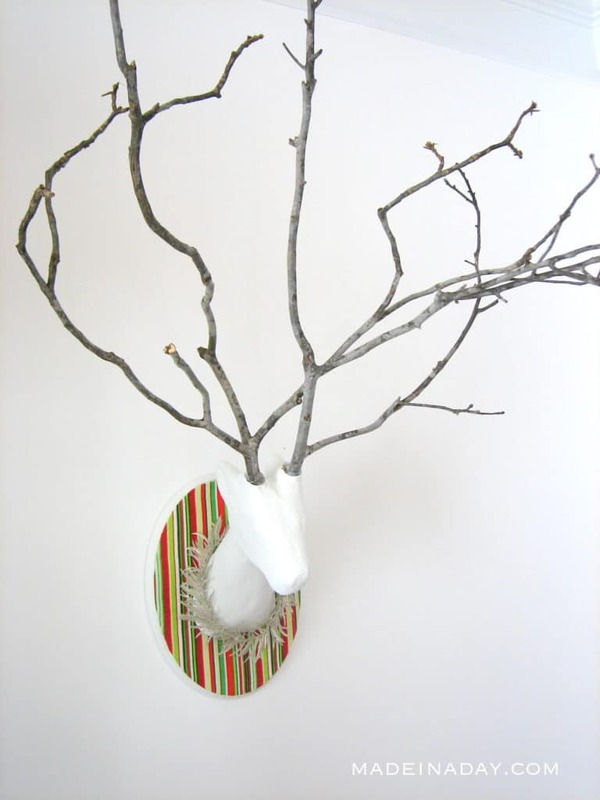 What a great twist to use branches for the antlers too!! Pinning now! Great idea! Those faux deer heads can be so pricey. I never thought how simple it could be to diy one. And I love your unique touch, too. Hi! 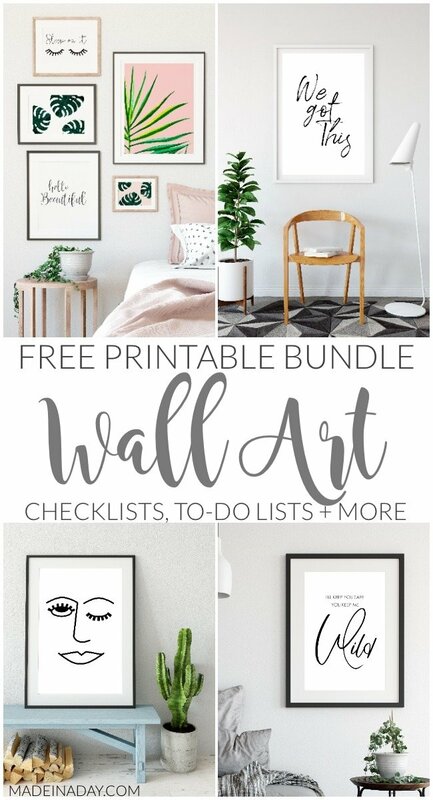 I’m featuring you today at The Weekly Creative link party 🙂 Thanks for linking up this awesome project! So fun! 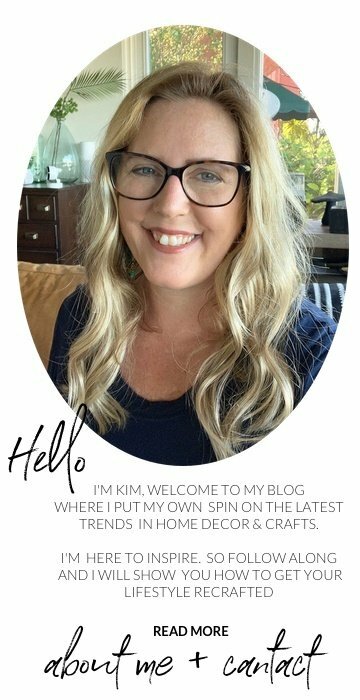 Thanks for sharing at I Made It! Monday. Can’t wait to see what you link up this week. Ooo, that’s too cool – I love your deer head!! This is so awesome! 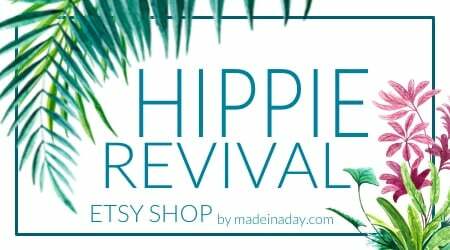 Would love it if you linked up on my blog hop http://www.w-t-fab.com/search/label/bloghop. Also let me know if you’d like to follow each other! What a cute idea! SO clever to use the branches as antlers. I love it! This is so cool! It turned out great! This is cute! I have two little trees that had to be cut waiting outside my back door. Still deciding what to do with them. I was thinking of painting them, mounting them in a pot, and decorating them each season–Easter, Christmas, Halloween, etc. 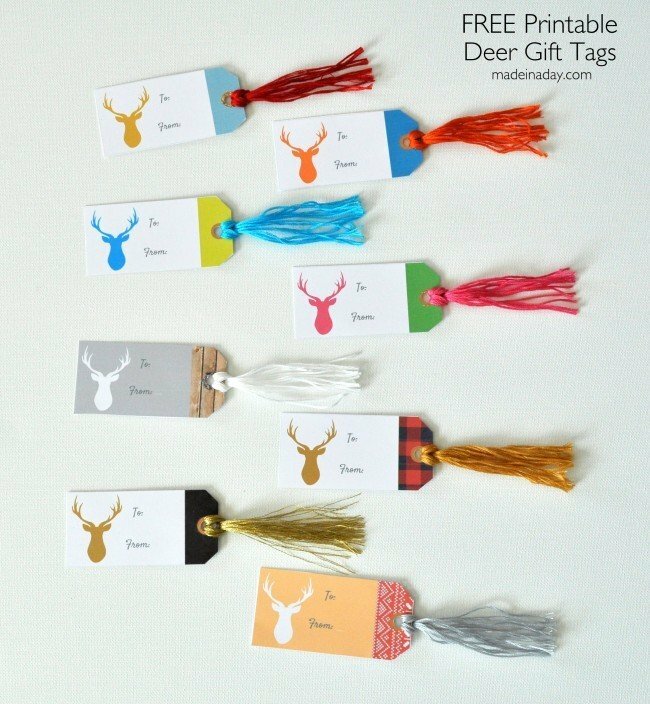 I wonder if I could just skip the deer, but somehow mount them from the wall in a similar way. Very cool look! Thanks for sharing it! I think that is all kinds of freaky wonderful!! I do believe I will make these myself! Thanks! This is so gorgeous! Do they still sell the faux deer at Michaels? Yes I think they still sell them. I want to say I saw one a week ago. Thank you~!! Great job on the project! Looks store bought! Love him! I’d definitely leave him up all year! LOVE, LOVE, LOVE!!!!! I AM SOOOOOOO GOING TO TRY THIS PROJECT. THANKS FOR THE INSPIRATION. SO CREATIVE!